I'm a big fan of Clarins but I have to admit that I do think of them as something of a "mummy" brand. It's not that I think of them as old-fashioned or fussy and I certainly find their products desirable so perhaps it purely comes from the fact that I've grown up noticing the recognisable red font in my mum's bathroom, or maybe it's because they are so well established? Part of the problem may lie in the fact that they are firmly rooted in the department store mid-market category which I associate with a certain type of sales assistant, or maybe it's down to the price of some of the products. Anyway, it turns out that I'm not alone in this perception and earlier this year, Clarins launched Daily Energisers, a skincare range specifically targeted at a younger market, with prices to match. I've recently started using Clarins Daily Energizer Cleansing Gel and although I haven't been using it for long enough to comment on the long-term effects, I've been impressed so far. I like using a face wash in the morning when there's an emphasis on speed and convenience. I've already deeply cleansed my face free of makeup the night before so it's simply a case of removing any night cream residue and freshening my skin for the day ahead and for this purpose, a wash serves me well. 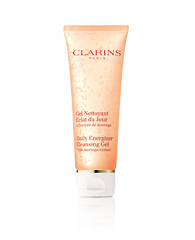 Clarins Daily Energizer Cleansing Gel is lightly foaming and a little goes a long way. It's easy to apply and feels gentle on the skin. It has a gorgeous fresh scent which stays true to the brand's roots. Skin is left feeling clean and soft. At £10.50 for 75ml, I feel that this offers good value for money and is worth checking out whether you're new to the brand or simply looking to discover the range.